Most computer mice are made of plastic, glass or metal. But one vendor has done away with those materials, and created a virtual mouse beamed from a laser projector. 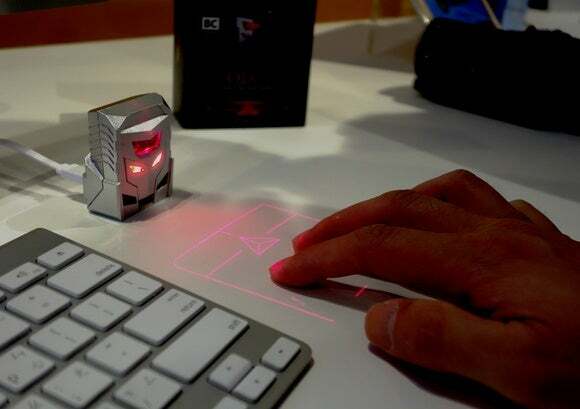 ODiN is the world’s first laser projection mouse, claims its creator, Taiwanese company Serafim Technologies. The device was shown off on Monday, a day before the Computex trade show in Taipei. Users who buy the product will receive a small projector that can sit on top of a table, and connects to a PC via its USB port. It works by displaying a virtual trackpad on a hard surface like a table. For users, this means they’ll essentially see a small box, made out of red light, with the right and left click buttons projected at the top of the trackpad. To read the gestures, the projector has built-in sensors that can track a user’s finger movements over the trackpad. The company created the product as a way to meld together mouse and touchscreen functions together, said Serafim’s CEO GZ Chen. For instance, the product’s virtual trackpad can read multi-finger gestures. When a user taps the trackpad with two fingers, and swipes left, the PC’s Internet browser will move back a webpage. By swiping right, the PC’s browser will move forward a webpage. Users can also pinch the trackpad with two fingers to zoom in or zoom out. I briefly tried out the ODiN and found that it takes time to get used to. The mouse cursor often stuttered, as the product tried to read finger movements. But the product generally worked, although it felt more like a novelty, rather than a better replacement for a mouse. Serafim’s CEO said it also developed the product, as a way for certain industries to do away with computer mouses that collect germs and dirt over repeated use. The company plans to continually offer software updates to the ODiN, as a way to optimize its functions. The ODiN launches this month and will be priced at $69. It was also featured on Kickstarter.